Never Stop Believing, a befitting title for a book that inspires, motivates and has you believing you can achieve anything. Sally Obermeder is one of those woman who have experienced the lows and highs of life and used every single one of them to her best advantage. In Never Stop Believing Sally shows that she is just a woman like everyone else but with a determination and a love for life that she used to help her struggle through what she was given. My initial reaction to this book was that of not another cancer story written by a TV personality. Those who are familiar with my reviews will know I loathe books that are published due to the notoriety of the author or those written by journalists who too often produce a dry media read. How wrong I was with Never Stop Believing. This is not the tale of a TV personality who decided to use their unfortunate battle to make money but the tale of a woman who had my emotions flowing. Sally Obermeder writes with professionalism, style and flow. She held my interest from the beginning to the end, allowing me to travel smoothly through her life and relate to it on a woman to woman basis. Sally Obermeder inspires. The if I can you can too messages is spoken loud and clear in Never Stop Believing. The thing I loved about this book was its ability to take me from one emotion to another so smoothly, not leaving me feeling like I was on a rollercoaster but on a cloud floating, looking down on the story as it unfolded. I laughed, cried and felt the love and pain as I turned the pages. Never Stop Believing is one of those books you just want to keep reading. One can only imagine the way Sally and Marcus felt when, at 41 weeks pregnant, she was told she had stage three breast cancer and would be induced immediately. For Sally and Marcus this should have been a time of celebration. A time to hold that baby they had waited so long for and had traveled the road of IVF for. How does one deal with bringing a baby into this world faced with the uncertainty of the length of your life ahead of you? For Sally Obermeder it was with sadness and unknown quantities but it was also with the love for her daughter and immense support from her husband, family and friends who rallied around her. 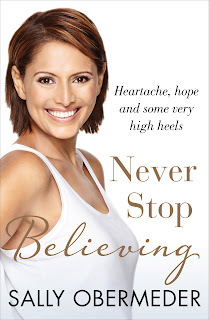 Never Stop Believing is on my highly recommended list for women. It will move you, change your outlook on life, make you feel blessed for each day but above all encourage you to live life to the fullest and with love in your heart. Never Stop Believing is a celebration of life. Sally Obermeder is a true inspiration to women worldwide.